I DL the update 8.6.4.1 and it appears to have fixed my problem where it was crashing while the app was hidden. If I import .fbx files the textures are mirrored ONLY in renderzone as Justin noted; They are correctly orientated in shade and full shade and also vray. So the error is within the renderzone import settings... I've checked it on multiple files... ALL contain the same display error. I did send the formz and fbx files to tech support; but have received no response other than the receipt of file. I prefer to assume that tech is working on correcting the error in the next update? This does not address the display mismatches in the material editor... but they may be related? FormZ works great for me but I have trained myself to avoid those little issues that FormZ notoriously hasn't been able to handle, editing within a group being one of them. Instead, I copy group contents to a new file, make the change and paste back when done. Use the program to its strengths, don't risk its weak areas, they will cause you frustration every so often. 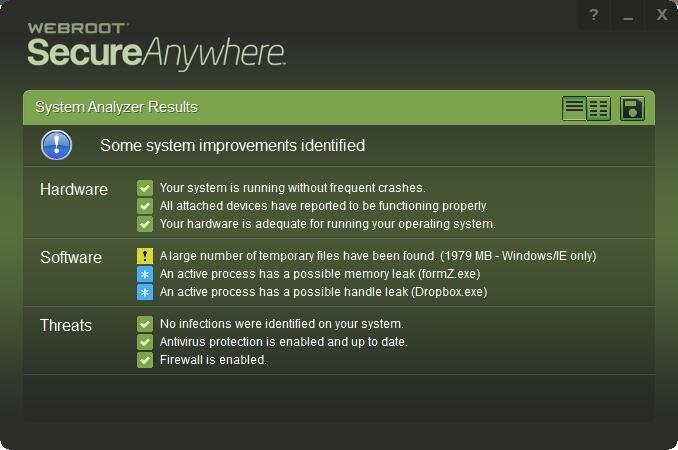 I have Webroot Secure Anywhere installed on my machine. It just told me there may be a memory leak in formZ. This is version 8.6.3.1. Has this been addressed on the latest release for Windows? See attached screen shot. I have Webroot Secure Anywhere installed on my machine. It just told me there may be a memory leak in formZ. This is version 8.6.3.1. Has this been addressed on the latest release for Windows?﻿ See attached screen shot. A memory leak is simply a portion of memory (virtual) that is reserved by a process and then abandoned with out being released for re--use (by the same process or others). To our knowledge there are no significant memory leaks in formZ. We are aware of some of small leaks that are beyond our control as they are in third party technology we use (ACIS, file translators etc) and even in Windows itself. These will show as leaks in formZ because we are the process that they are associated with on your machine. The leaks total a few Kilobytes and are really not materially significant. We monitor leaks as part of development process to be sure were are not using memory inefficiently or leaking. Webroot would be more useful if it warned when leaking a significant amount of memory! Even a large memory leak would hardly be noticeable on todays machines as the inactive pages would be swapped out of physical memory to virtual memory and in a 64 bit app there is plenty of addressable memory. so you are very unlikely to actually run out of memory because of a leak. Hi Martin. We have receive the files and we are investigating the issue further. We can not promise a fix for the "next" update, but we hope to know more about this soon.,. I updated to 8,6,4 but the materiaals and other things like trees were not in the new instal folder. Where should I download them?